Development Synergy: Education For All...Who Is For Education? Education For All...Who Is For Education? efforts will almost amount to nothing as the very basic communication needs will be lacking. 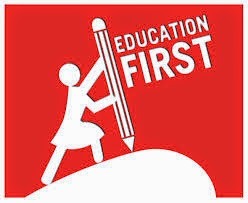 Having recognized the importance of basic education for every child, in the year 2000, the government of different countries of the world adopted the six internationally agreed UNESCO Education For All (EFA) Goals to meet the basic learning needs of every child, youth and adult by 2015. Inspite of these clear goals, reaching these goals to attain Education For All is still a challenge, as some countries are still lacking behind . We have few months left to the 2015 target however, many countries are still yet to achieve these goals. Nigeria, for example still has about 10 million out of school children. The question is, if the world have adopted 'Education For All', who is out there for education? Who is interested in ensuring that children in their communities access their basic education rights? Do you think you have a role to play in ensuring that every child receives free and compulsory basic education? It is obvious that the government cannot do it alone. In the bid to promote community ownership of schools, led to the establishment of School Based Management Committees (SBMCs) in communities to support school governance, mobilize resources and take ownership of schools in communities. Education is very key to national development and lack of basic education can lead to destruction. If every community will arise and ensure that every child has access to schools, significant progress will be made in our societies. Even as communities arise to their responsibilities, the role of civil society organizations in advocating for the increase in quality and access to free basic education cannot be over-emphasized. Stand up for Education today!